For centuries, gold has remained a store of value as fiat currencies have and, if history and modern trends are any revelation, always will fall to asymptotal zero at the hands of the monetary manipulators. The global marketplace is today at the mercy of a currency war which risks savings and the middle class to encourage hasty consumption, speculation, and malinvestment to prop up asset classes and generate the wealth effect in an environment saturated with exorbitant paper gains cloaking real and eventual losses, not to mention the unseen and myriad gross externalities veiled by unsubstantiated optimism. As the Federal Reserve has continued to expand its balance sheet, one can observe a strong positive correlation between the dollar price of gold and the extent of the Fed's dollar assets. Of course, the dollar price of gold, in keeping with any other asset, is susceptible to market corrections and speculative buying and selling, as well as geopolitical trends, financial crises, and competing assets or substitutes. Silver is one of these potential substitutes whose properties are both aesthetically appealing and industrially useful. 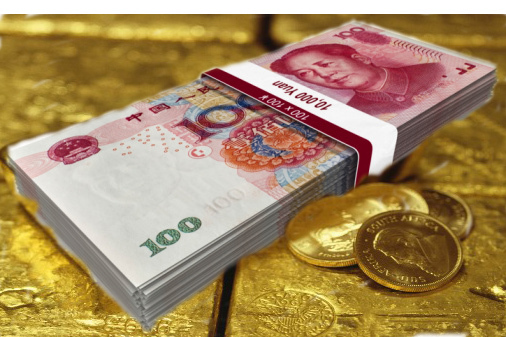 Across the globe, central banks, including the People's Bank of China, have begun to hoard undisclosed supplies of gold to conceivably protect their balance sheets from the depreciation of their USD reserves and to potentially compete with the USD for market purchasing power and status as the world's reserve currency. The PBC has probably protected this information to allow for further transactions for gold at the lowest possible prices. Once this information becomes public, the gold price will likely skyrocket in response to an evidenced reduction of supply on the market. If the Federal Reserve introduces another dose of quantitative easing, and if interest rates continue to remain low, both of which are highly probable courses for the United States, the dollar price of gold is sure to eventually climb. The timetable for this eventuality is based upon the willingness of the banks of global manufactures, namely China, to vendor finance the insolvent United States. If recent trends are any indication, they will not long endure this process, and China may not even be able to afford this option. Akin to America's Great Depression, the United States is poised to relate to China in the fashion in which Great Britain struggled during the 1930s. Finally, it seems, China may allow its yuan to appreciate to allow its laborers the fruits of their labor instead of propping up the United States markets. With this impending decoupling and the end of exported goods for imported inflation, the dollar price of gold is sure to take flight.